Home / How Much Do Clear Braces Cost? Clear braces are an option for those who want to straighten their teeth but don’t want cumbersome metalwork in their mouths that looks obvious when they talk or smile. There are several makes of clear braces on the market and different orthodontists will offer one or more of these as an option for braces. Although the cost of clear braces is slightly higher than metal braces, it’s not unaffordable. What potential wearers of invisible braces need to understand is the time and technology that goes into planning and making clear braces, which justifies the higher cost. The process of making clear braces uses cutting edge, computerised technology and precision engineering in specialised dental laboratories. The lab use the data and models sent to them by the orthodontist and this is specific to each individual. The process of straightening the teeth is carefully mapped out over the course of a calculated treatment plan. The result is the shipment of individual sets of specially-made clear braces to start the treatment. 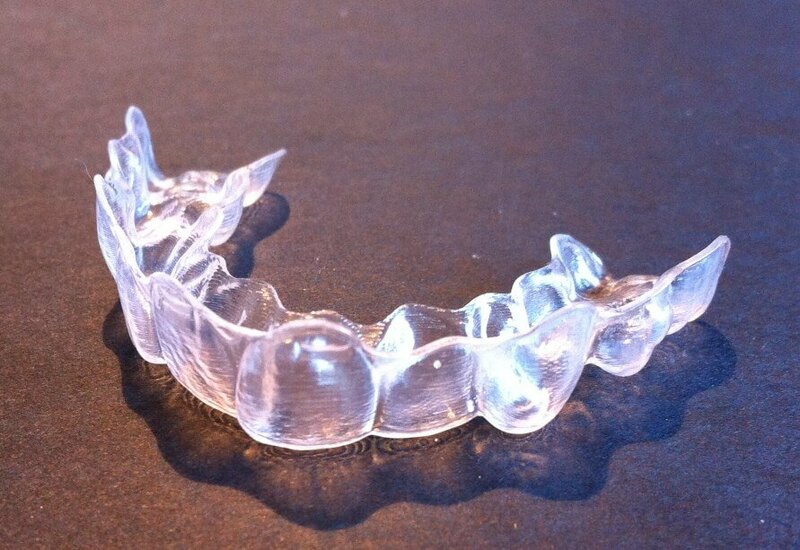 Invisible braces are supplied in the form of tough plastic ‘aligners’ for both the upper and lower sets of teeth. These are a little like plastic trays, but they’re incredibly precise, as each set of aligners maps the changes needed to guide the teeth into their new position. Depending on the changes needed, various sets of aligners will be issued to the orthodontist, who will replace and refit each new pair of aligners approximately every 4 weeks, until the end of the treatment. The longer the period of treatment that’s required the higher the cost, but not to the point that it becomes ridiculous. If treatment’s only minor, the period could be as short as 6 months. If the teeth need a longer time to move, treatment could possibly span a year or more. Prices for clear braces will vary. Typically, clear braces cost between £2,500 and £4,500 in total. Occasionally there may be additional charges made by the orthodontist if any additional work needs to be undertaken prior to the braces being fitted. For example, if tooth extraction’s needed to make space in an over-crowded mouth, this could be an additional cost. Simple treatment cases may cost less, whereas longer and more complex treatment plans could be more. Orthodontists nearly always offer different payment plans, including arranging official finance for the treatment, to make it more affordable. It’s important to ask what the options are and to find out exactly how they work, to help budget for the cost. A typical payment plan could be in the region of putting down £300-£500 per month, but this depends on the finance arrangement and the period over which it runs. What’s important to remember is there’s nearly always a finance plan available for every budget and every type of clear braces treatment. This means that having clear braces is an affordable choice for all who choose to go down this route.